Nebraska is back at home for week four after a shocking loss to Northern Illinois. There is a lot going on around the Nebraska football program right now as news broke yesterday that Athletic Director Shawn Eichorst was let go. Injuries are also mounting for this Nebraska team, which is reeling right now following two consecutive losses. Before we get to the game, there is plenty of recruiting news and buzz to discuss. As always, I’ll take you through what I know, who is visiting and where Nebraska stands with the next crop of Huskers. >>The latest edition of Greg’s Guys, my list of top 10 Huskers targets for the 2018 class, is out and has some pretty significant changes. >>Nebraska made the cut and is in the top six for the nation’s top-rated athlete, Talanoa Hufanga. More on him below. >>Despite the rough day on the field last week, the recruits on hand were not fazed. First, let’s start with what we know. 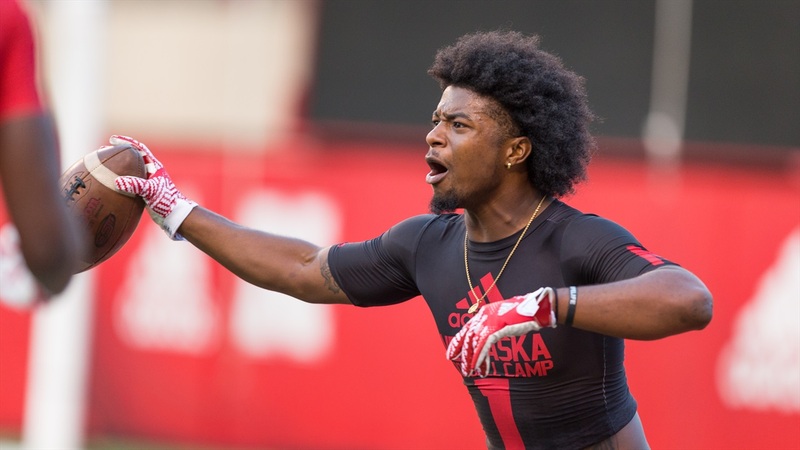 Four-star defensive back Christian Tutt‍ from Thomson, Georgia is on his way to Lincoln Friday morning. We also know that Tutt is excited to meet Gabrielle Union and her husband Dwayne Wade, who will be making a return trip to Lincoln this weekend for the Homecoming game at 2:30p.m. Tutt has been around the Nebraska coaches quite a bit. He went to Nebraska’s satellite camp in Georgia this summer, and a few weeks later skipped a family wedding to attend the June 23 Friday Night Lights camp. My feeling is that this trip is about showing his mom and dad that Nebraska is the place for him. On the football side of things with Tutt, I spoke with his high school coach Rob Ridings about Tutt’s abilities and where he projects in college. When I asked Coach Ridings about the schools that contact him about Tutt the most he mentioned Nebraska, Ohio State, Penn State, Texas, Georgia and Alabama. He also remarked that he feels like the most important factor for Tutt will be where he feels most comfortable. So that wherever he goes, it needs to be the place he feels most comfortable and fits in the best. Nebraska is the clear leader for Tutt in my opinion and while they may not come away with a verbal commitment this weekend from him, they have an every opportunity to close down his process for all intents and purposes. >>There are rumors floating around about surprise visitors being in Lincoln this weekend. One of the names floating around is 4-star defensive end/outside linebacker and Oklahoma commit Jalen Redmond‍. Nebraska has been after the Oklahoma native for a long time and the staff thinks very highly of him. It will be hard to flip him from OU if he indeed makes the trip, but fans should feel encouraged that he is at least giving them a visit to be sure of his Oklahoma commitment. >>I mentioned above that Nebraska made the top six for Talanoa Hufanga‍ . I can tell you guys that per a west coast source, Nebraska made a strong impression by coming to his high school game the day before they played against Oregon. He was an unofficial visitor for that game (on the Oregon side), but Nebraska’s gesture adds another brick in the foundation that he will be taken care of at Nebraska. >>I reached out to several recruits to gauge their reaction to Eichorst being let go yesterday. None of the recruits I talked to had even talked to another recruit about the news in their group texts or individually. Lincoln Southwest wide receiver Justin Holm‍ had the best summary of what was going on. Wise words from the young man.